It's a bird, it's a plane, it's a ... whale! Unfortunately, when you're glued to your cell phone, you'll probably never notice any of these things. That was the case with one "whale watcher" in California who was staring at his phone so intently, he failed to see the giant humpback swimming just two feet away. While the man may have missed it, a professional photographer about 50 feet across from him did not. 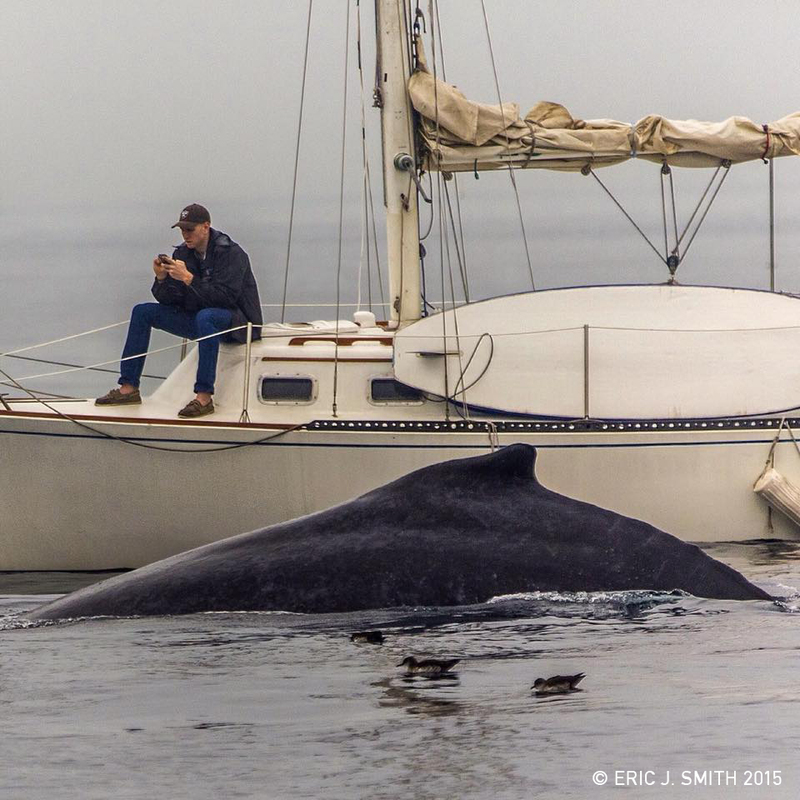 Eric Smith, creative director for CBS EcoMedia Inc., captured a photo of the oblivious man next to the breached whale and posted it on Instagram Tuesday, calling it a sign of the times. "Hey dude! Stop texting. There's an enormous humpback whale two feet from your boat!" the caption read on Smith's post, which has received nearly 300 likes. He told CBS News that he got the shot while photographing a mom and her calf on Redondo Beach a few weeks ago. "A mom was out there with her calf, flapping, breaching, jumping, mouths eating fish -- it was fantastic," Smith said. And then there was this man, "he never moved from his phone." While scrolling through the 100 or so photos he took of the whales, Smith said he noticed about five that showed the whale next to the sailboat, and the man happened to be in the background. Women could be seen taking pictures from the front of the small sailboat, but the man was like "a statue in every photograph," Smith said. To be fair, Smith said he had no idea what the man was doing on his phone. He could have recently taken photos and was the middle of looking at them when he missed it. "The point is, he missed the whole thing," Smith said. If this isn't a sign that we're becoming addicted to our devices, what is? "I've been there, I get lost in the phone too," Smith said. "But this is really indicative that we have some serious issues to work through." Instagram users all seem to agree on one thing: "He missed out on something incredible." A sign of the times. Hey dude! Stop texting. There's an enormous humpback whale two feet from your boat! Shot this a couple weeks ago a mile from Redondo.